In my previous post, I provided the design pattern and Biml for a pure Type 2 Slowly Changing Dimension (SCD). When I say “pure Type 2 SCD”, I mean an ETL process that adds a new row for a change in any field in the dimension and never updates a dimension attribute without creating a new row. In practice, I tend to create more hybrid Type 2 SCDs where updates to some attributes require a new row and others update the value on the existing rows. A similar pattern that I find I implement more often than a pure Type 2 is a Type 6 SCD. A Type 6 SCD builds on the Type 2 technique by adding current attributes alongside the historical attributes so related measures can be grouped by the historical or current dimension attribute values. The only difference between what I call a hybrid Type 2 and a Type 6 is that in the Type 6, there are no Type 1 attributes in the dimension that do not also have a Type 2 version in the dimension to capture the historical values. If you are comfortable with my design pattern for a pure Type 2 SCD in which a change of value in any column causes a new row, this pattern is quite similar. And the control flow is exactly the same. This pattern, as with my pure Type 2, assumes that rows are not deleted from the source system. You could easily modify this to check for deleted rows if needed. 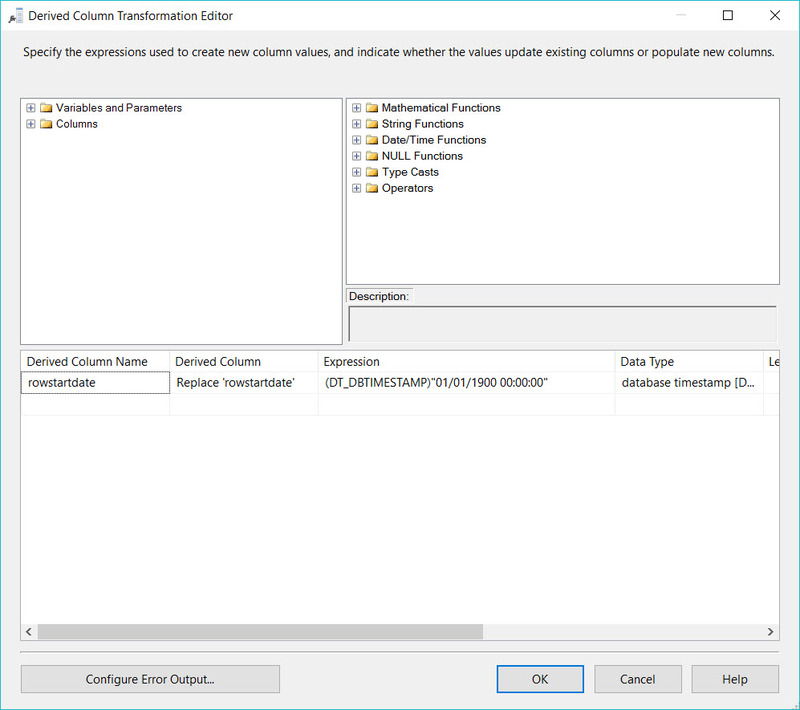 Execute the update statements to update columns and insert new rows. The update statements are different in this pattern, and I’ll explain those in detail below. The data flow looks like a pure Type 2 SCD, with the exception of an added derived column transformation and minor changes to the lookup and conditional split. Again, I use views to integrate the data, apply business logic, and add hashkeys for change detection. 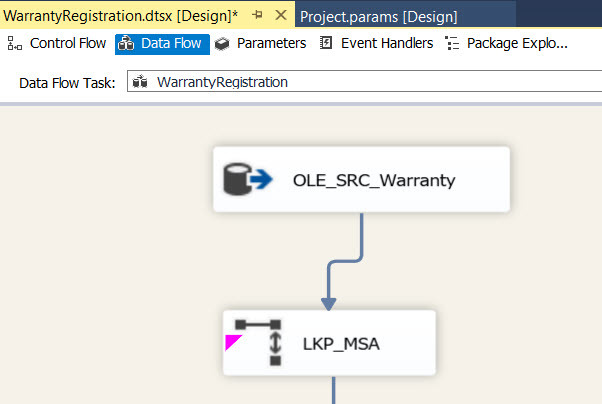 Then I use SSIS to perform the mechanics of loading the data. Retrieve data from my source view. Count the rows for package logging purposes. Perform a lookup to see if the entity already exists in the dimension table. If the entity doesn’t exist at all in the dimension table, it goes into the left path where I count the number of rows, add a derived column that sets the row start date to “01/01/1900 00:00:00”, and then insert the row into the dimension table. If the entity does exist in the table, I check it for changes. If there are changes to the entity, I count the number of rows, us a derived column to flag the type(s) of changes to make, and then insert the row into an update table. Entities with no changes are simply counted for audit purposes. In my example view below, the Route ID and Warehouse identify a unique route. The supervisor, route description and route type are all important attributes of the route. The route area identifies the metro area in which a route is located. If this should change, there is no need to see previous values; we just want to see the current value on every row. The RowEndDate value in this view will be used for routes that require a current row to be expired since my pattern is the leave the end date of the current row null. The lookup in my DFT compares the HistoricalHashKeyASCII column from the source view with the varchar version of the HistoricalHashKey from the dimension table and adds two lookup columns: lkp_ChangeHashKeyASCII and lkp_UpdateHashKeyASCII to the data set. Rows that do not match are new rows; i.e., that route has never been in the dimension table before. Rows that do match have a row in the dimension table and will then be evaluated to see if there are any changes in the values for that route. The no match output of the lookup are new rows for routes that are not in the dimension table. Since this is the first row in the table for that route, we want this row to be effective from the beginning of time until the end of time. The beginning of time in this data mart is 01/01/1900. Since the data is loaded multiple times per day, I use a date/time field rather than a date. If you only need the precision of a day, you can cut your row end date/time back to just a date. In my pattern, the current row has a null row end date, but you could easily add a derived column to set the end date to 12/31/9999 if you prefer. This time, I have to check to see if both the ChangeHashKeyASCII and the UpdateHashKeyASCII match in my conditional split. 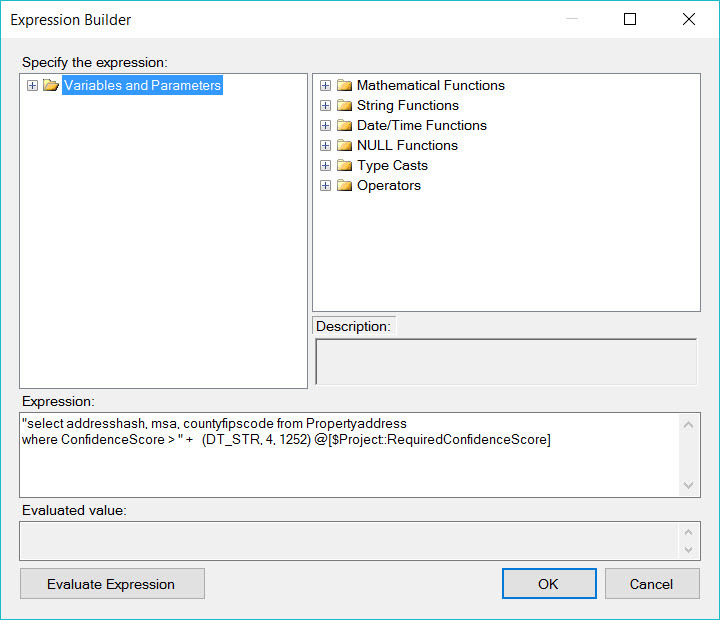 If both hashed values from the source view match the hashed values from the dimension table, then no changes are required and the row is simply counted for audit purposes. If either hashed value doesn’t match, there is an update to be made. We again compare the UpdateHashKeyASCII value from the source view with that of the dimension. If they don’t match, we set the UpdateInPlace flag to true. If the ChangeHashKeyASCII values don’t match, we set the UpdateNewRow flag to true. If a row has both types of changes, both types of updates will be made. My update table contains the UpdateInPlace and UpdateNewRow columns, so I can reference these flags in my update statements. 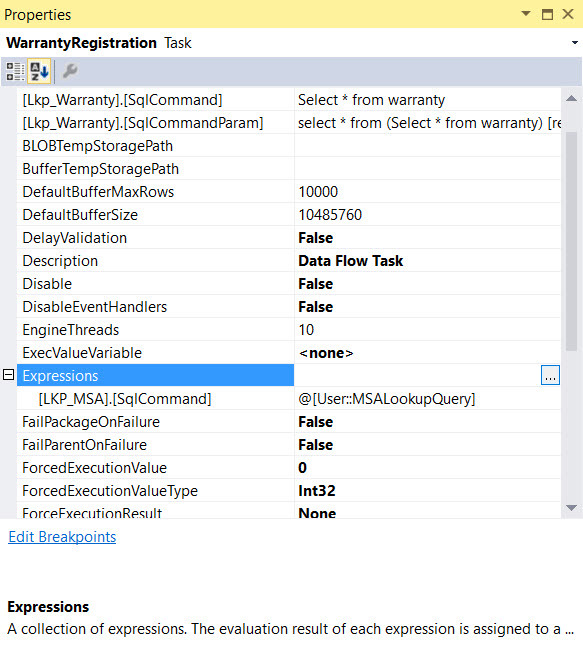 The update statements in the control flow take the changes from the update table and apply them to the dimension table. Three statements are executed in the Execute SQL Statement labeled SQL Update DimRoute. 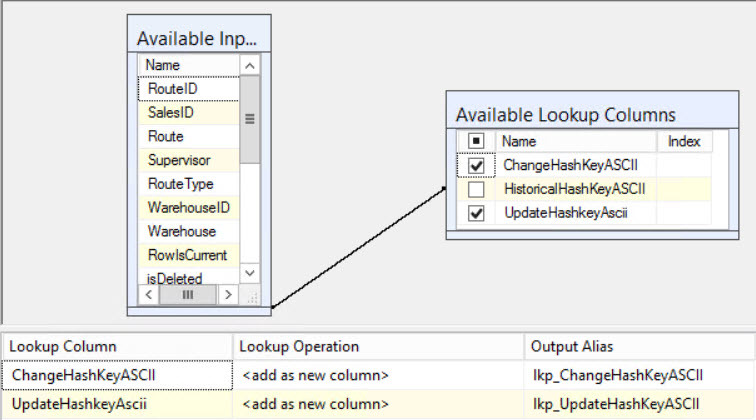 The first statement updates the values for the columns designated to be updated in place by joining the update table to the dimension table based on the HistoricalHashKey column. This is the same as performing updates in a Type 1 SCD. The second statement expires all the rows for which a new row will be added. The third statement inserts the new rows with the RowIsCurrent value set to 1 and the RowEndDate set to null. If you are using Biml, you know that you can create a design pattern for this type of dimension load and reuse it across multiple projects. This speeds up development and ensures that your Type 2 Hybrid or Type 6 dimensions are implemented consistently. I’ve pasted Dim2Hybrid and CreateDim2Hybrid below. Once I have my source view, dimension table, and update table in the database, the 3 Biml files added to my project, and BIDSHelper installed, all I have to do is right click on the CreateDim2Hybrid.Biml file and choose Generate SSIS packages to create my package. Most data warehouses have at least a couple of Type 2 Slowly Changing Dimensions. We use them to keep history so we can see what an entity looked like at the time an event occurred. From an ETL standpoint, I think Type 2 SCDs are the most commonly over-complicated and under-optimized design pattern I encounter. 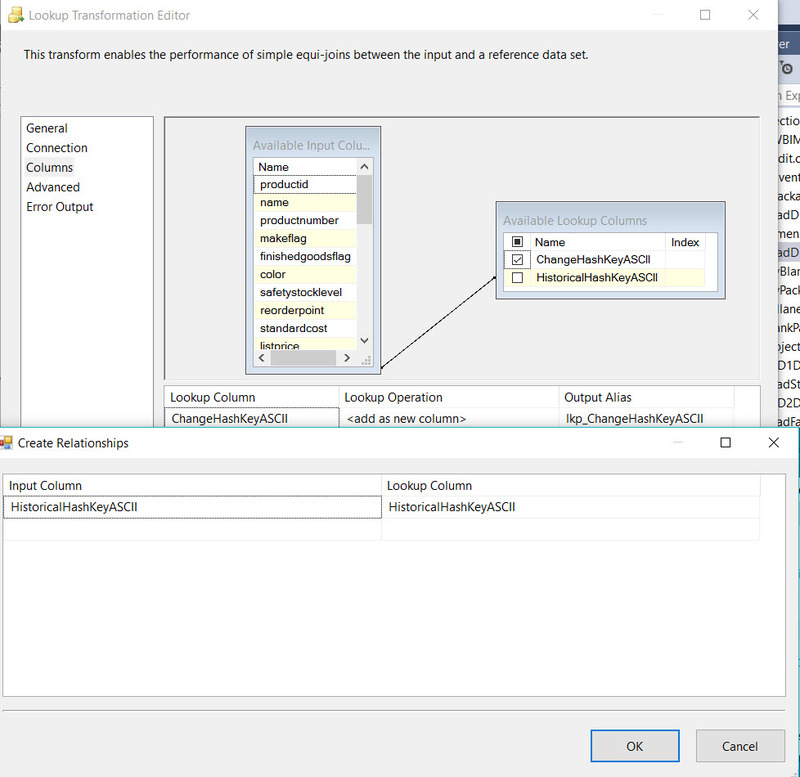 There is a Slowly Changing Dimension Transformation built into SSIS, but most people recommend against using it as it isn’t very efficient. I think many of the people that do use it do so simply because they feel it’s easier than digging in and understanding the operations that need to be done in order to roll your own Type 2 SCD processing.The most common mistake I see in SCD 2 packages, whether using the built-in transformation or creating your own data flow, is that people use OLEDB commands to perform updates one row at a time rather than writing updates to a staging table and performing a set-based update on all rows. If your dimension is small, the performance from row by row updates may be acceptable, but the overhead associated with using a staging table and performing set-based update will probably be negligible. So why not keep a consistent pattern for all type 2 dimensions and require no changes if the dimension grows? I am here to encourage you: don’t be scared of slowly changing dimensions. Once you learn the design pattern, you will find they aren’t that difficult to understand. And once you have the Biml, creating them is fairly painless. 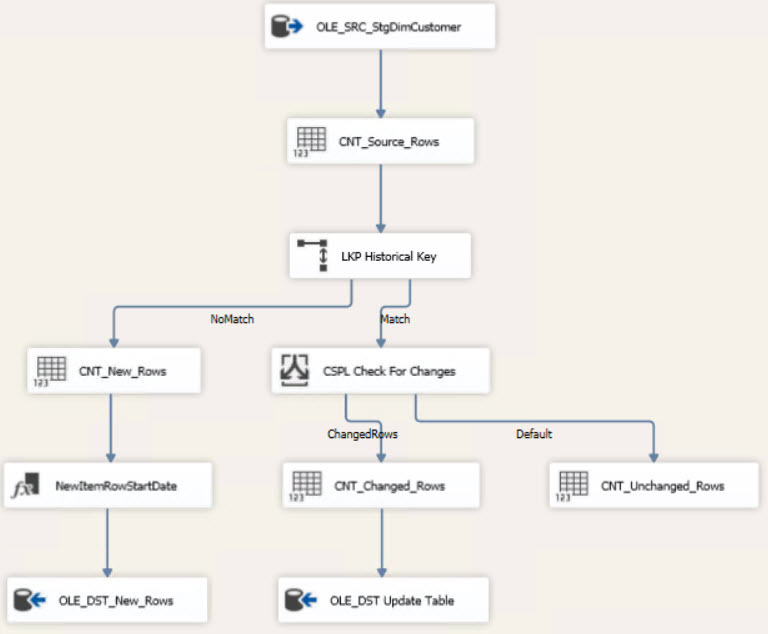 BimlScript allows me to create a reusable design pattern for SSIS that I can employ for each Type 2 dimension that I create. Despite the need to keep history, my Type 2 SCD doesn’t look that much different from my Type 1 SCD. In fact the control flow is exactly the same. I start with an audit step to log the beginning of package execution. Then I truncate the staging table used to contain my updates. Next I have the Data Flow Task to insert new rows into the dimension table and updates into my update table. Then I run an Execute SQL Task to perform the updates. Finally I log the end of package execution. The Data Flow Task looks a like a Type 1 SCD until the end, where I have a Derived Column Transformation before I insert new rows into my dimension table. 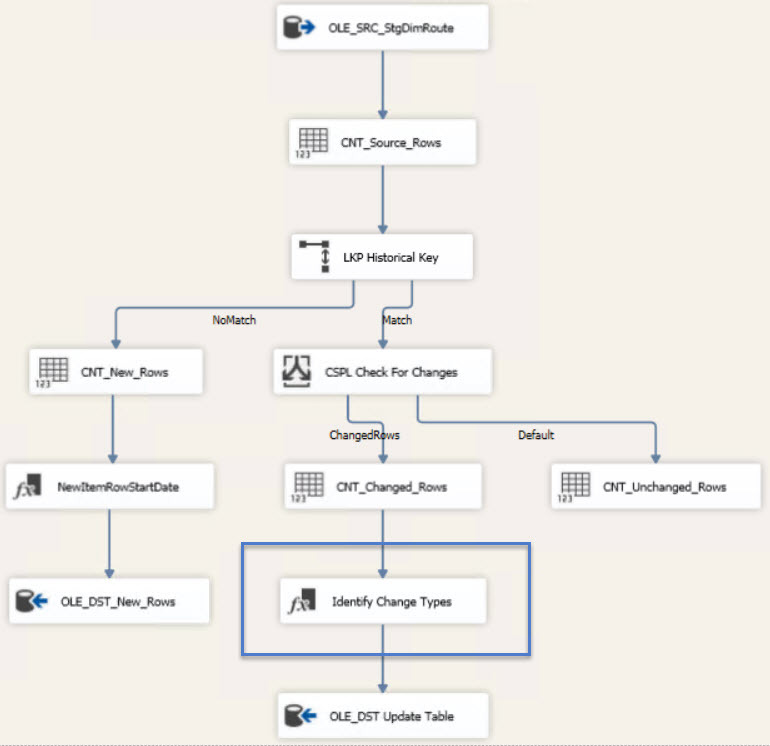 As with my Type 1 pattern, the combination and transformation of the data (the business logic) is performed in a view in SQL Server, and the mechanics of capturing the history is performed in SSIS. Perform a lookup to see if the entity already exists in the dimension table (more info on that below). If there are changes to the entity, I count the number of rows and then insert the row into an update table. The lookup in my DFT compares the HistoricalHashKeyASCII column from the source view with the varchar version of the HistoricalHashKey from the dimension table and adds the lookup column lkp_ChangeHashKeyASCII to the data set. Rows that do not match are new rows, as in that product has never been in the dimension table before. Rows that do match have a row in the dimension table and will then be evaluated to see if there are any changes in the values for that product. The no match output of the lookup are new rows for products that are not in the dimension table. Since this is the first row in the table for that product, we want this row to be effective from the beginning of time until the end of time. The beginning of time in the data warehouse is 01/01/1900. Since I often load the data multiple times per day, I use a date/time field rather than a date. If you only need the precision of a day, you can cut your row end date/time back to just a date. In my pattern, the current row has a null row end date, but you could easily add a derived column to set the end date to 12/31/9999 if you prefer. For existing products, we only want to update the products for which some attribute has changed. We check for changes using a conditional split. When we performed the lookup against the HistoricalHashKeyASCII value, we added the lookup column lkp_ChangeHashKeyASCII from the dimension table. The match output from the lookup flows into the conditional split. Then we check to see if there is a difference between the change hash from the source view and the change hash in the dimension table that we have added to our data set. 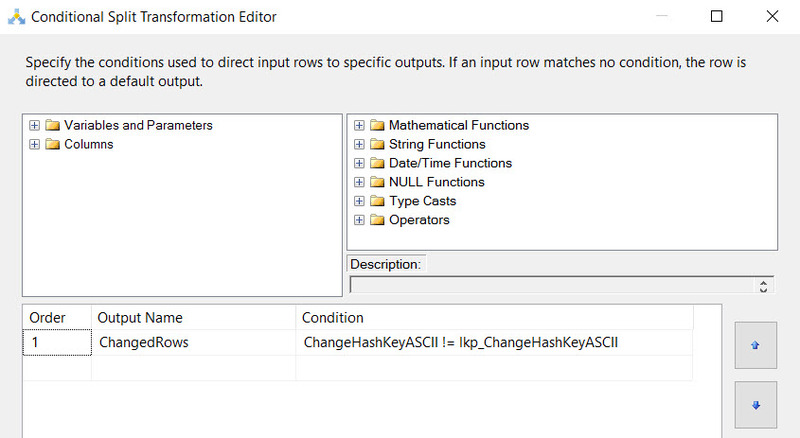 If the change hash values are equal the row hasn’t changed and we can pass it on to get the count of unchanged rows. If the change hash values are not equal, we know some column will have a value to update and we can pass it on to the update staging table. Set the row end date and row is current flag on all existing rows in the dimension for which there is an update. Insert the new rows for the changed products. I have a Dim2.Biml file that just contains the design pattern with code blocks that allow me to pass parameters to it for the particular dimension I’m making. I also have a Biml file that contains the project level connection managers. Then I have a Biml file that obtains the package specific parameters and passes them to the Dim2.Biml file. This is the file that contains my design pattern. This file simply feeds values into the code nuggets in the Dim2.biml file. In practice, I store these values in a table and change this file to pull the values from a table so when I generate SSIS packages from this file, all my type 2 dimension packages are generated rather than just one. 8 SQL files to make the schemas, tables, views, and stored procedures for the product dimension. This pattern is for a pure Type 2 SCD. I’ll post again soon with a pattern that handles hybrid Type 2 and Type 6 SCDs. For more info on Biml, see my other Biml posts or check out BimlScript.com.